BUSAN, Republic of Korea - The Ohio-class guided-missile submarine USS Michigan (SSGN 727) (Blue) arrived in Busan, April 25 (local), for a routine visit during a regularly scheduled deployment to the Western Pacific. 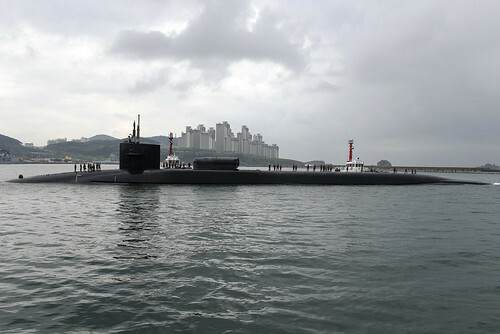 During the visit Sailors will experience the culture and history of the ROK, as well as foster outstanding relations between the U.S. Navy, ROK military and the local Busan community. “We are looking forward to a chance meet up with our ROKN [Republic of Korea Navy] partners and learn about the culture of Korea, for the first time for many of us, myself included,” said Turk. Michigan is the second submarine of the Ohio-class of ballistic missile submarines (SSBNs) and guided missile submarines (SSGNs), and the third U.S. Navy ship to bear the name. Michigan is homeported in Bremerton, Washington and is forward deployed from Guam.